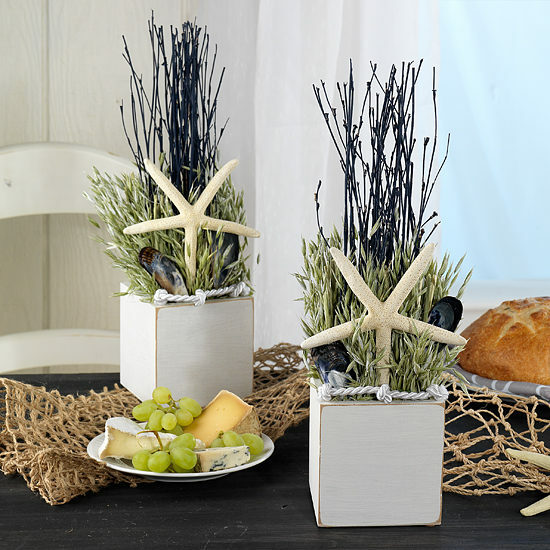 A nod to nautical styling that can go modern or quaint, this decorative set makes a great gift for anyone with a home on the coast… and those who wish they had a home on the coast. Lovely as part of a table setting or as book ends. Handcrafted using white washed avena, blue wild twigs and naturally harvested starfish and mussels. White wooden boxes are gently weathered around the edges and embellished with rope at the top.